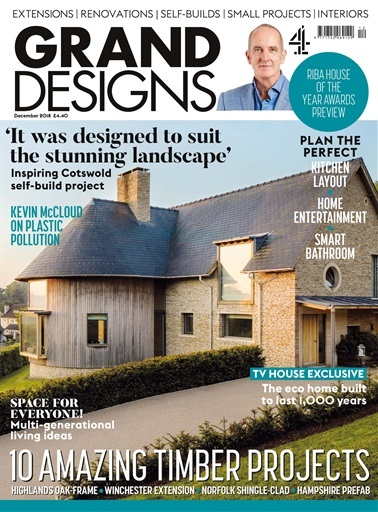 One of Svenskhomes A-rated family homes features in the current issue of Grand Designs Magazine. It was back in August 2014 when we met Chris Game from Plaice Architects at a Svenskhomes open day, he was designing a new eco-home for John & Liz in Norton, Suffolk. The clients were keen to build an eco-home which was truly sustainable and after several meetings to explore their requirements and satisfying their tender requirements, Svenskhomes were selected to supply the timber frame for their new green home. The property has been selected by Grand Designs magazine as one of 10 Inspirational Buildings in their GD Projects Grand Guide for 2018. © Grand Designs magazine, as featured in December 2018, granddesignsmagazine.com.